December 1st, National Mistletoe Day! 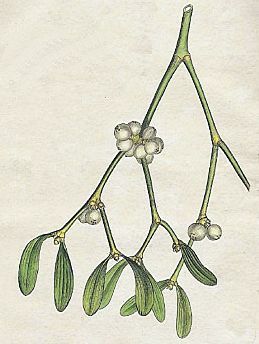 December 1st, National Mistletoe Day! 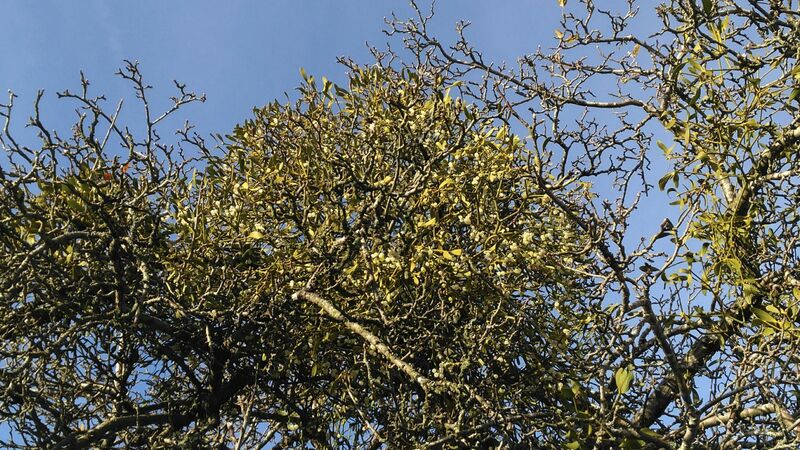 And interest in mistletoe is building rapidly (as usual!). The first of the Tenbury Wells Mistletoe Auctions was held last Tuesday and was, I’m told (sorry I wasn’t there guys, missed the craic, hope to be there next week), much the same as normal. Lots and lots of mistletoe lots, and the ever-present media interest. The Daily Telegraph published a photo (see right) the next day but I’m not sure who else ran features. Some may be waiting until nearer Christmas. 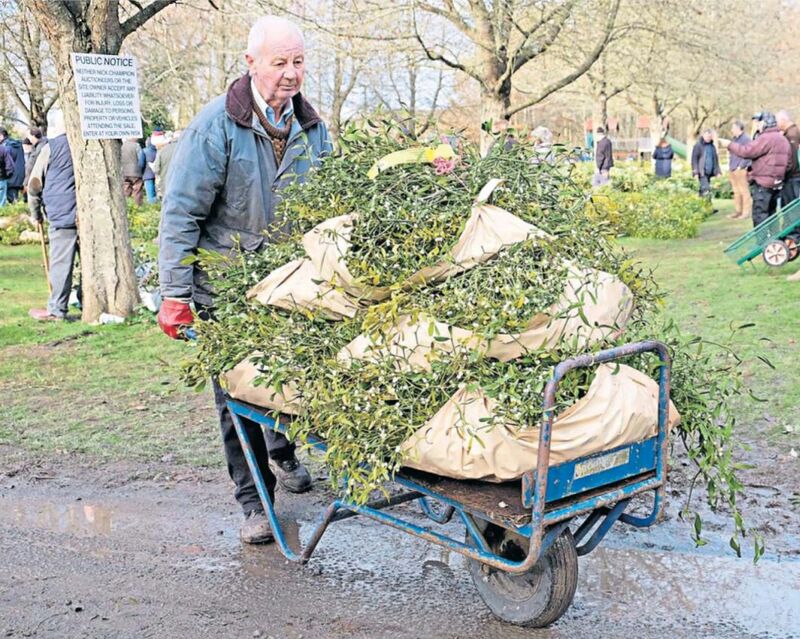 Those are wholesale prices of course – don’t confuse them with what you’d pay in the florist, greengrocer or supermarket – by the time mistletoe gets there much has been discarded and it has been handled, washed and cut numerous times (and therefore much more costly!). But if you’re a supplier these prices are a little worrying – they’d hardly pay for your fuel getting the mistletoe to the auction. 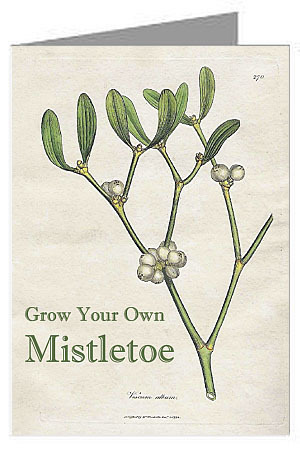 I prefer to think of the mistletoe sales as a way to subsidise mistletoe management rather than a way to make mega-profit! Meanwhile I’ve been busy all week with other mistletoe business, as indeed have others: I was the sole male at the 100-strong Wolverhampton Ladies Luncheon Club (est. 1932) on Wednesday where the table decorations were made with mistletoe supplied by mistletoe supplier Mark Adams. Mark himself featured in a picture in the Guardian a few days ago (see left). 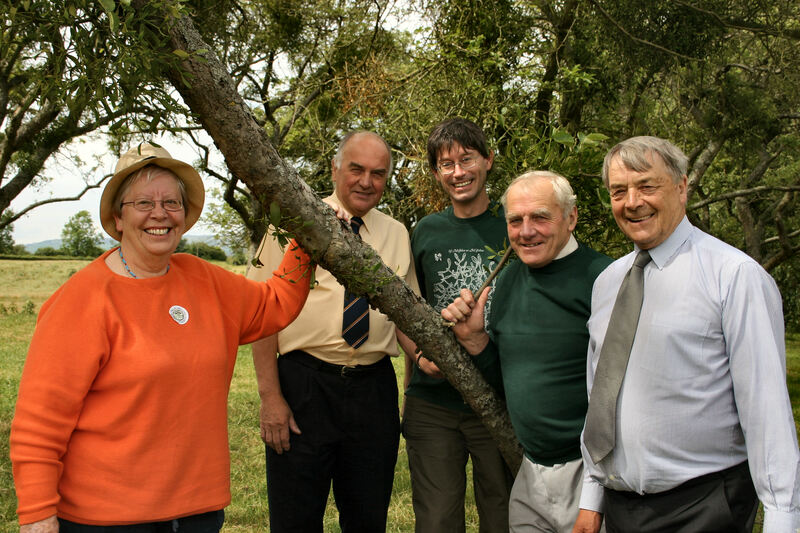 Tomorrow, Saturday 2nd, is Mistletoe Festival Day in Tenbury Wells, where there’ll be a mistletoe kissathon in the morning (details at http://www.tenburymistletoe.org/festival.html) and in keeping with the spirit of very ancient Christmas past, a Druid Mistletoe Ceremony in the afternoon. Mistletoe Information: for general mistletoe info visit the Mistletoe Pages website. Mistletoe Berries, almost ‘glowing’ in the winter sun. Berkeley Power Station, the UK’s first commercial nuclear power plant, sits on the edge of the River Severn in Gloucestershire. Opened in 1962 and closed in 1989 it still dominates the area, though it is now in advanced stages of decommission. And it is surrounded by mistletoe, as this is the nucleus (geddit??) 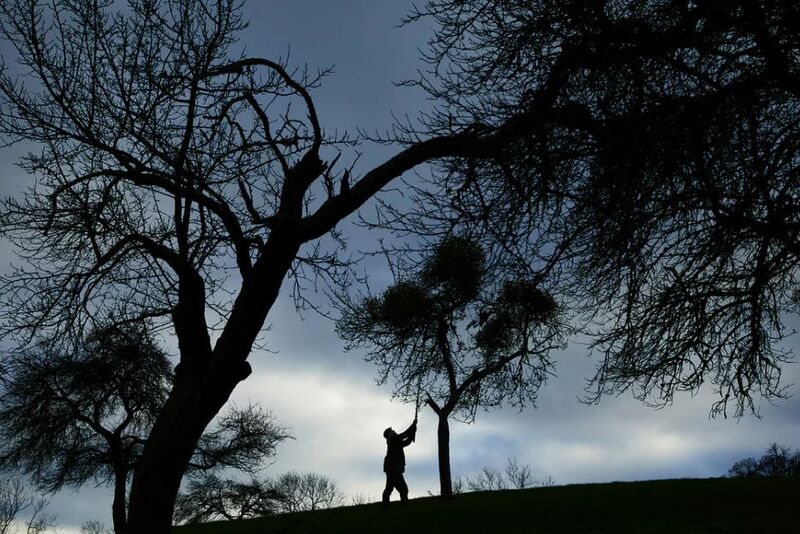 of UK mistletoe country. Berkeley Castle, just up the road, is at the opposite extreme of modernity, lived in by the same family since the 12th Century. 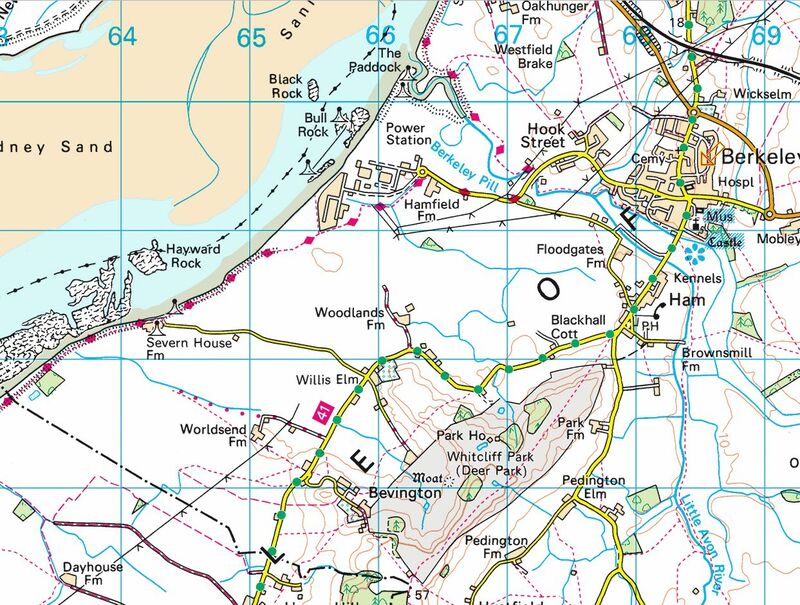 But back to the mistletoe – this is the Severn Vale, home of most of Gloucestershire’s mistletoe, growing in old orchards, parkland lime trees and riverside poplars – as well as lots of other habitats and hosts. And, last Saturday, we took advantage of a sunny day (merging effortlessly into grey rain later) to walk a circuit from Bevington, just south of Berkeley town, along the high ridge of Whitcliff Deer Park, into Berkeley town, out onto the riverside at the Power Station and along the floodwall before turning back inland. At first, not much mistletoe –the southern end of Whitcliff Park is planted with Beech and Oak, neither particularly good for mistletoe. But further north there is the inevitable line of Lime trees, typical of English Parkland and festooned with mistletoe. Further on, in the vale itself there is a glorious excess of mistletoe on many of the road and streamside (aka drainage ditch-side) Poplars with yet more out by the Power Station site. It makes for some interesting landscapes. Nothing to do with the Power Station, obviously, but did berries glow in the winter sun more than usual? Lastly, some mistletoe links – for general mistletoe info visit the Mistletoe Pages website. Not long now until the first mistletoe trading of the season and yes, the plants are looking good yet again! That’s several years in a row now. Perhaps a bit more variable this season but here are some quick snapshots (click to enlarge them) I took of mistletoe in my mother’s garden earlier today – good material, albeit a little out of reach. And some nicely offset by holly, though only a male tree so no holly berries. It’s the best mistletoe she’s ever had in this particular apple tree (she did have a lot in another, smaller, tree a few years ago but that one succumbed, unfortunately, to a surfeit of mistletoe. If only she’d known someone who could have given some management advice. Oh wait…). Mistletoe Diary this season will be covering the full range of mistletoe stories, especially the weirder ones. Planned content includes the a family mistletoe tradition gift box, complete with sprig of, er, plastic mistletoe, the question of whether hanging up a plastic model of a KFC chicken basket could have the same effect as mistletoe, how best to use the Yellow Pages in a mistletoe encounter, the hazards of dwarf mistletoes in woodland ecosystems and a review of birdlime – a sticky mistletoe by-product of yesteryear used to ensnare birds, kill soldiers and which features, oddly, in literature ranging from Aesop to C. Day Lewis. And anything else which happens to come along in the next few weeks. No berries on this specimen, but that’s because it is a male plant. 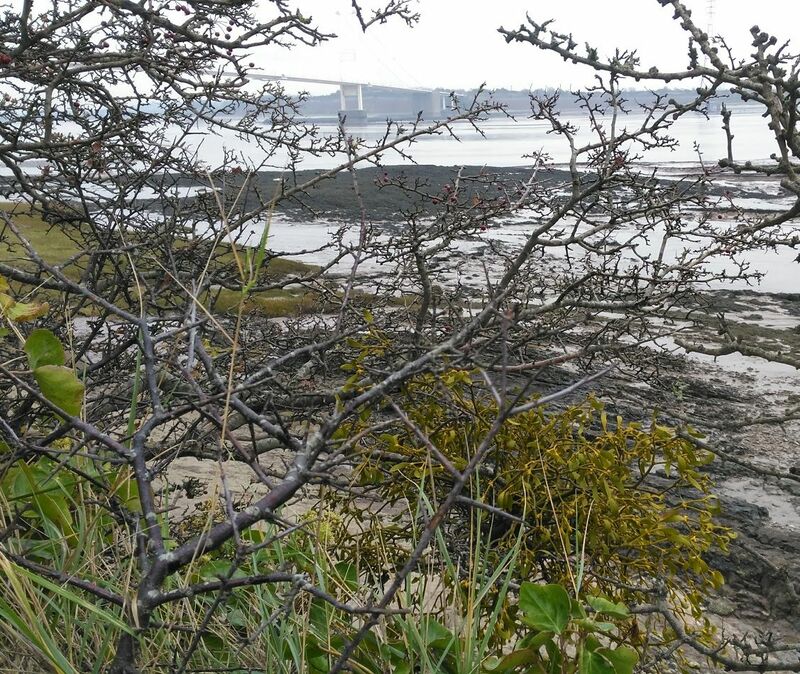 A picture taken on the Severn Estuary yesterday, mistletoe on hawthorn in the foreground, old Severn Bridge (hardly contrasting against the sky) behind. Full details and downloads on how to buy or sell are on Nick Champion’s website here. Details from the Mistletoe Foundation here. 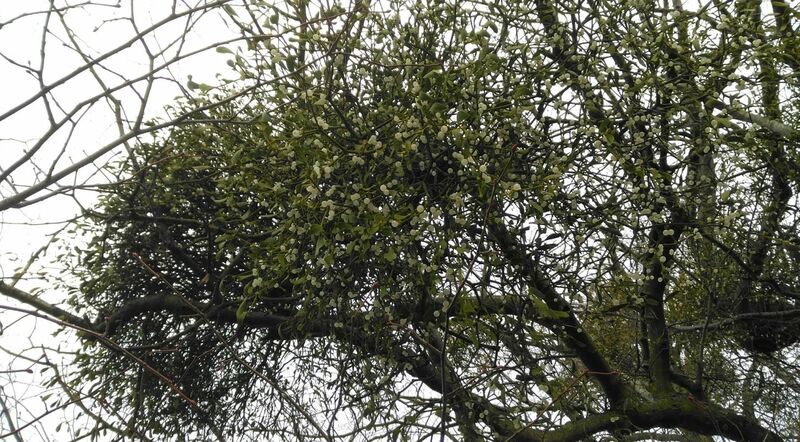 State of the mistletoe ‘crop’ this season? Variable but generally good, lots of berries on the plants I’ve been looking at, but more about that soon. 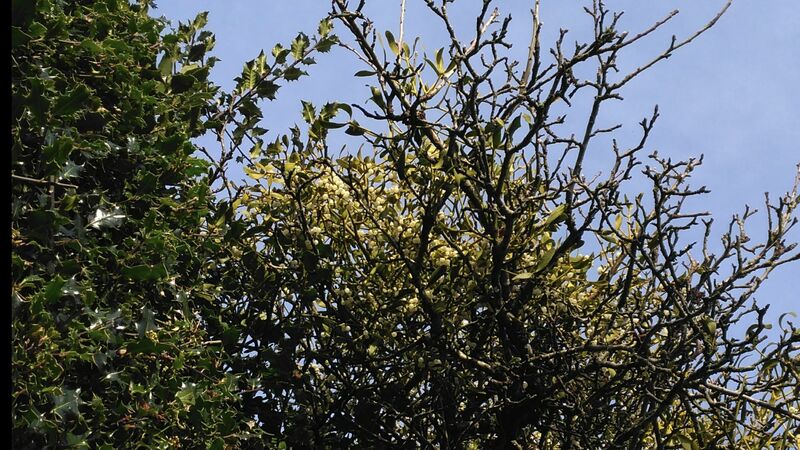 And have a look at the various Mistletoe Information Sheets (and other downloads) from the Mistletoe Matters consultancy.